It has been a while since I do a night shot. Not always easy, since a long day at work is not conducive to late night photowalk, plus, given it’s still summer-ish, the day remains relatively long and it doesn’t get dark till around 9pm. Well, as the day gets shorter with upcoming seasons of autumn and winter, things may change just yet. 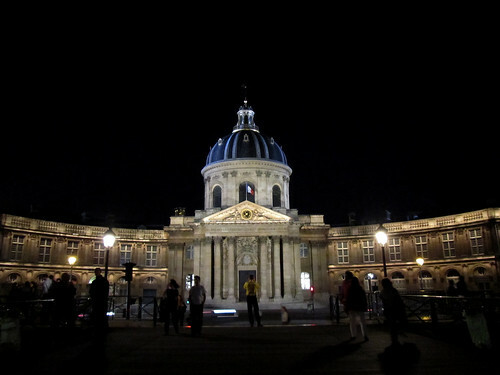 Institut de France, the upholder of all things cultural and educational in France, stands on the Left Bank of River Seine at one end of Pont des Arts. Home to the Académie Française (whose members’ main duty is to protect the French language) and a number other academies as well as foundations, museums and castles, the Institut was built on the former site of Nêsle gate and tower that forms part of the Medieval city wall of Paris. As far as I know, the Institut is normally not open for public visits except for certain specially arranged tours and the likes. aha – that’s because the bridge is not at the same level at the building, plus the building is across the street. see there’s someone walking at the street level and note the difference?